Cool idea isn’t it? Tomatoes growing up the wall. 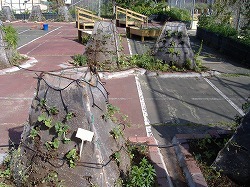 Veggies growing in pyramids. This high-school in Hod-Ha’Sharon makes research on agriculture which can be done by people in their apartments, balconies, walls or roofs. They also study how to re-use and recycle water. They test whether tomatoes can grow in bags on the wall or whether it is possible to cultivate plants in triangle-shaped pyramids, made from soil in plastic foils. This method advantage is that the ground area can multiply in 3 times the number of plants growing comparing to conventional flat bed. Given that most people in the world live in dense urban environments this is the way to go. How can we feed a growing world population? My guess is that the first thing is to learn how to “produce” soil and then find a whole lot of creative new ways of using it so we can grow on whatever spaces we have available. Here we’re testing the idea of producing soil and growing in bread crates. It’s looking promising at this stage! 10 bread crates stacked on a wooden pallet (2 stacks of five shallow crates). 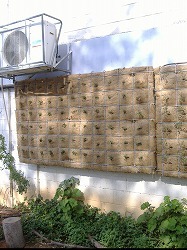 Make soil in the lower crates (Bokashi and potting mix) and grow herbs and salad in the top ones. You maybe don’t grow so incredibly much food but it’s looking like a small family could take care of all their own food waste on a space no bigger than a pallet. On asphalt or a sunny corner at the back of an apartment building. Love to hear your ideas! There are probably many crazy ideas worth testing — who knows, some of them may be what our children’s children end up using to grow their own food. It would be nice to think we’ve helped make it happen. Follow bokashiworld on facebook if you’d rather, I’m posting the blogs there along with a lot of other bits and pieces as they turn up. Previous Entry Herrings make the best soil! Next Entry Soil and souvlaki.